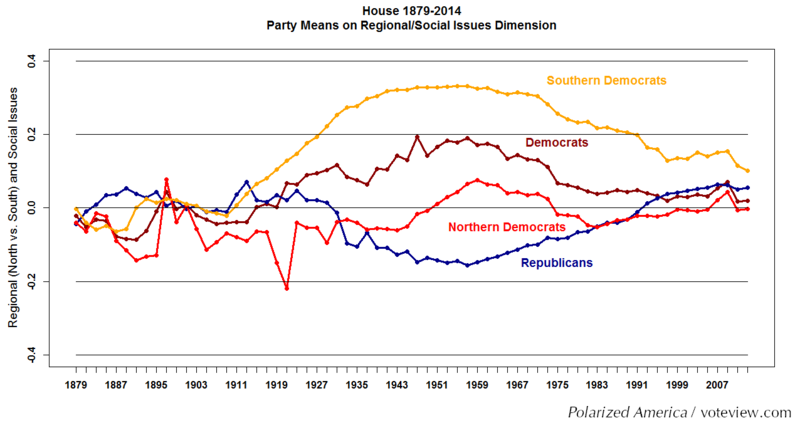 Below are graphs of the difference between the Republican and Democratic Party means on the first DW-NOMINATE dimension from the end of Reconstruction through the the first session (2013) of the 113th Congress. This difference in first dimension means is a good measure of the level of political polarization. 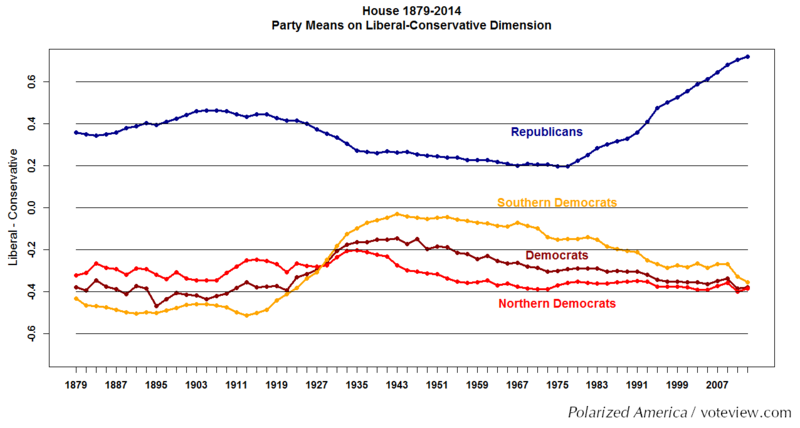 By this measure polarization is now at a post-Reconstruction high in the House and Senate. With few exceptions, roll call voting throughout American history has been simply structured. Only two dimensions are required to account for the great bulk of roll call voting. The primary dimension is the basic issue of the role of the government in the economy, in modern terms liberal-moderate-conservative. The second dimension picked up regional differences within the United States -- first slavery, then bimetalism, and after 1937, Civil Rights for African-Americans. With the passage of the 1964 Civil Rights Act, the 1965 Voting Rights Act, and the 1968 Open Housing Act, this second dimension slowly declined in importance and is now almost totally absent. Race related issues - affirmative action, welfare, Medicaid, subsidized housing, etc. - are now questions of redistribution. 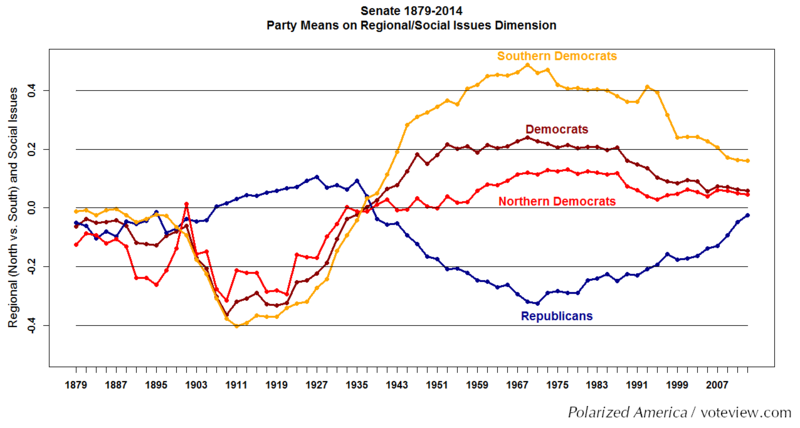 Voting on race related issues now largely takes place along the liberal-conservative dimension and the old split in the Democratic Party between North and South has largely disappeared. Voting in Congress is now almost purely one-dimensional - a single dimension accounts for about 93 percent of roll call voting choices in the 113th House and Senate - and the two parties are increasingly polarized. 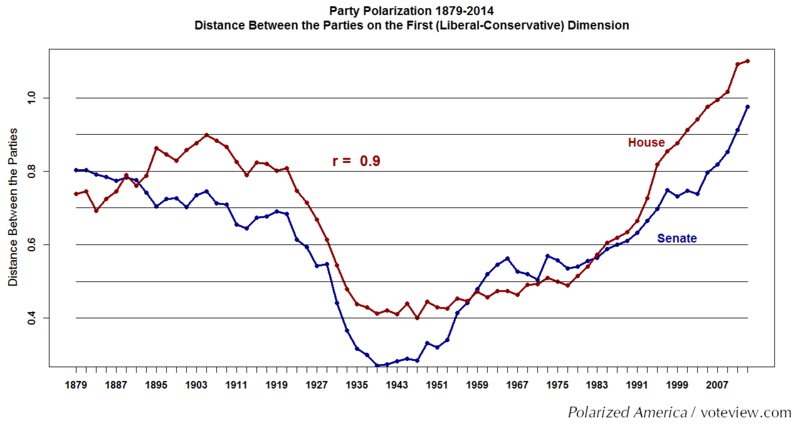 Polarization declined in both chambers from roughly the beginning of the 20th Century until World War II. It was then fairly stable until the late 1970s and has been increasing steadily over the past 25 years. 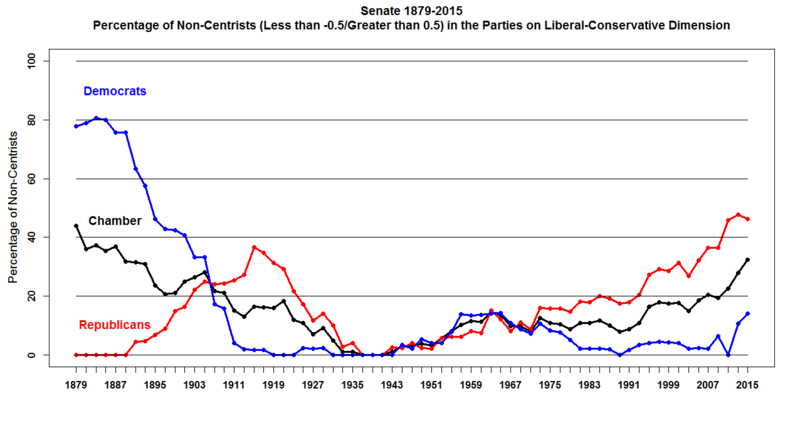 Our (Poole and Rosenthal, 1997) original D-NOMINATE estimation ended with the 99th Congress. 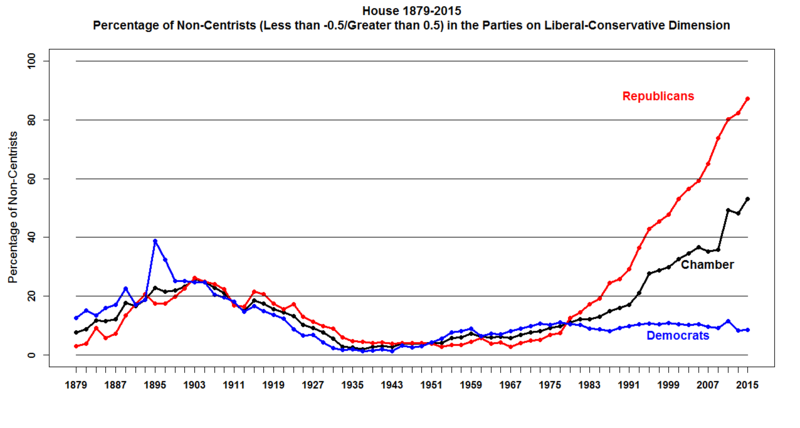 Interestingly, Congresses 100- 113, if anything, mark an acceleration of the trend (especially in the House). 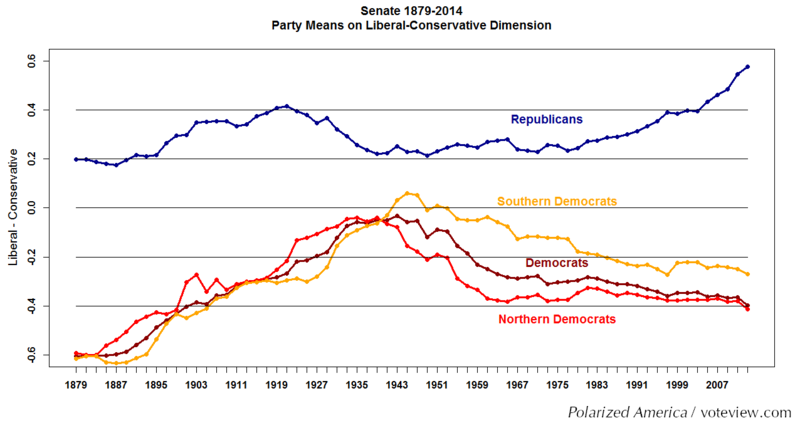 Note, however, that the acceleration is smooth and does not show a particular jump in polarization induced by the large Republican freshman class elected in 1994. 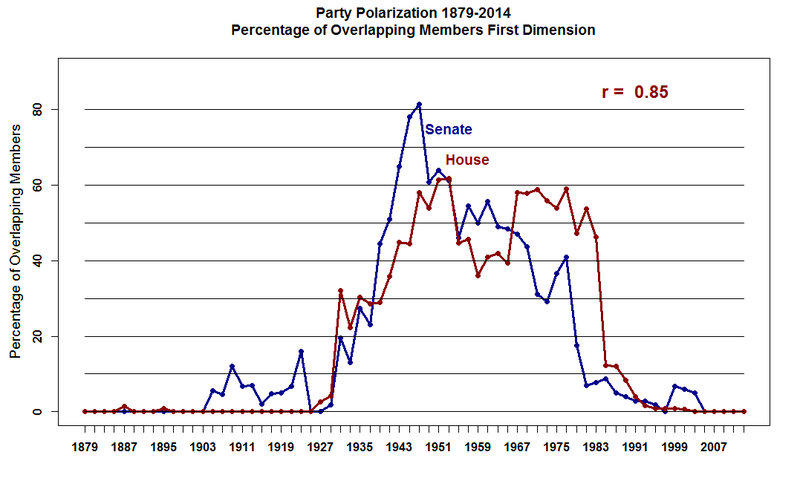 Polarization in the House and Senate is now at the highest level since the end of Reconstruction. 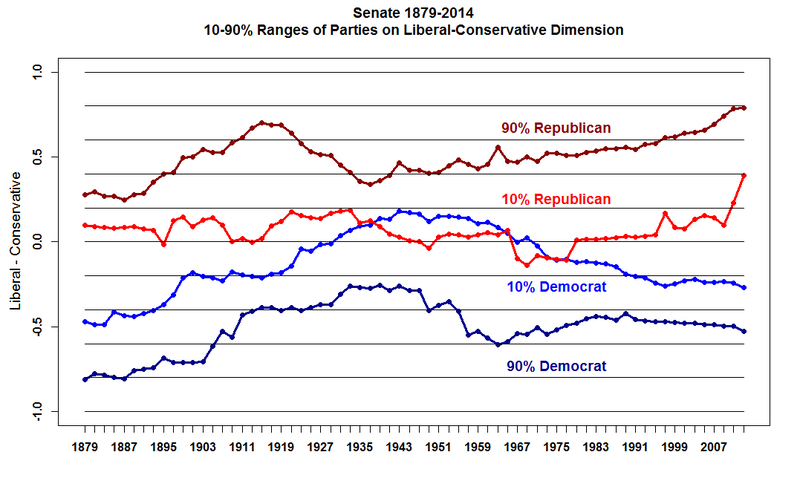 In addition, the percentage of moderate Representatives and Senators continues to plummet. In the House the percentage of moderates (-.25 to +.25 on the first DW-NOMINATE dimension) has declined to about 10 Percent in both Chambers. 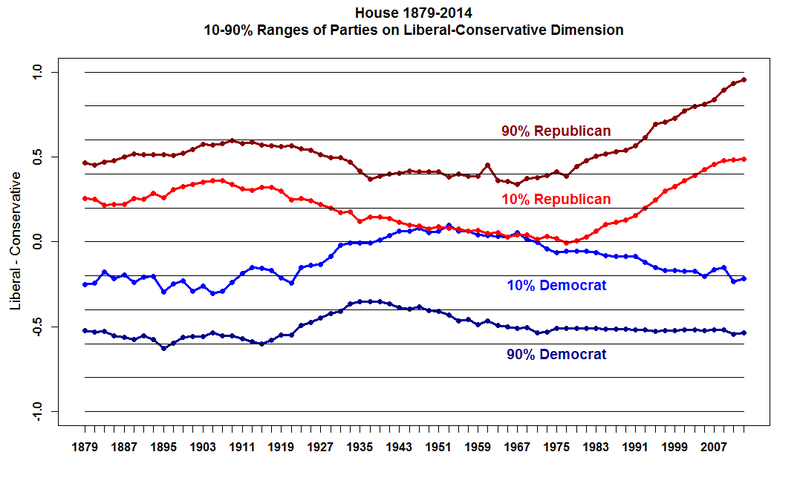 Below are a number of graphs that display the polarization of the parties in Congress since 1879. After the graphs we have links to the data used to construct them in a variety of formats.